Airbus’ next-generation airlifter – BelugaXL – made a brief appearance in the skies above Flintshire on Saturday for only the second time since its maiden flight last July. The plane was spotted flying over Flintshire at around 4.30pm en route to the Airbus base at Toulouse following a series of tests at Shannon airport in Ireland earlier today. It’s understood the BelugaXL crew carried out crosswind training and rejected take-offs (RTOs) as part of the certification process which will see plane carry out around 1000 hours flight testing. 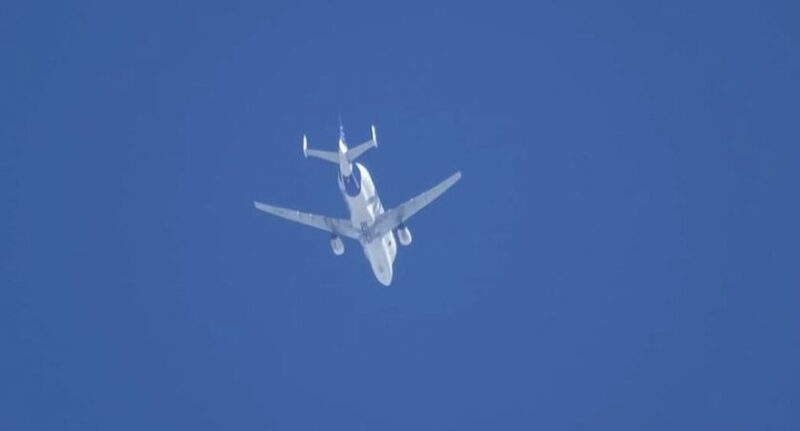 Jude Maloney captured these pictures as BelugaXL flew over Denbighshire on Saturday towards Flintshire. BelugaXL made its debut in Flintshire on Valentines Day with a spectacular landing at Hawarden Airfield, it was followed by two days of testing at Airbus Broughton. Production of BelugaXL aircraft continues to advance as planned the planemaker has said, Airbus has decided to “future proof” the company’s internal transportation network by adding another BelugaXL to the overall fleet as reported by Deeside.com last month. This expansion from the originally-targeted number of five airlifters to a new total of six will ensure the capacity provided by BelugaXLs – highly modified A330 jetliners tailored to carry large airframe components within the Airbus aircraft production network – can accommodate a range of potential future scenarios. Bertrand George, head of the BelugaXL programme at Airbus. The no. 1 BelugaXL performed its maiden take-off in July 2018 and is now being used in compatibility and verification tests at locations across Airbus’ European industrial network – including an initial trip during February carrying a set of A350 XWB wings from Bremen, Germany to Toulouse, France. This month, the second transporter was painted at the Toulouse facility. The BelugaXL will officially enter service later this year, and by 2023, the six aircraft will be fully operational, replacing Airbus’ existing fleet of A300-600ST Super Transporters, also known as Beluga STs. “This, however, does not suggest the five Beluga STs’ end, and their future is currently under consideration,” Airbus said. Reflecting on the decision to increase the number of BelugaXLs, Sabo recalled the similar step that occurred with its predecessor: “The Beluga ST programme went through the same decision-making process, and I am sure we would not have coped without the fifth aircraft – which was added in 2001,” he stated. With the BelugaXL soon to be operational, the proven Beluga STs are far from being written off. These original oversized cargo transporters could continue flying for another 10 to 20 years, so there are possibilities of a second operational life. “There is some way to go before we know for certain, but the first-generation airlifters might be flying much more widely,” according to Sabo.